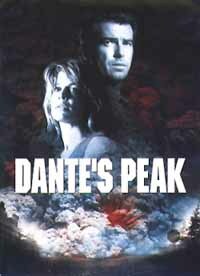 The official Web site for Dante's Peak. Thanks to last summer's blockbuster Twister, a new batch of disaster movies looms on the horizon. I'm not talking about anachronistic, old-style disaster movies like Daylight with clumsy dramatics and goofy premises. I'm talking about special effects extravaganzas like no one could have imagined just twenty years ago. Now, thanks to computer technology, Hollywood can serve up practically anything the writers and directors can imagine. We've seen towering dinosaurs in Jurassic Park and terrifying tornadoes in Twister; now we can experience the most destructive force in nature, a volcanic eruption, thanks to Dante's Peak. So let's just cut to the heart of the matter: the special effects. I could talk about the plot (which gives us Pierce Brosnan as a volcanologist investigating an awakening volcano in the idyllic community of Dante's Peak), but it doesn't amount to much. This movie is all about special effects (and anyone who thinks it's about the budding romance between Brosnan and Linda Hamilton as the mayor of Dante's Peak, well, I'd like to talk to you about some swamp land I own in Louisiana). This movie exists for one reason: to give us scenes of destruction beyond anything we could imagine. 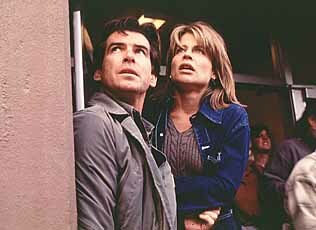 Pierce Brosnan and Linda Hamilton in Dante's Peak. And because it takes so long to get to the big eruption, the filmmakers give us an immediate sneak peek at the horrifying power of an eruption. The opening, pre-credits sequence shows Brosnan in the midst of a volcanic eruption, trying to get out of a small South American village as rock fragments hail down on his head. After giving us this quick taste of what's to come later in the movie, the movie shifts into low gear. The next hour plus of the movie is fairly conventional stuff. It even evokes some similarities to Jaws as it kills off a couple skinny dippers and then has the town counsel arguing about land values plummeting if word spreads about their volcano. In order to keep everyone in Dante's Peak and be assured of mass confusion when the volcano finally starts to rumble, the filmmakers give us a volcano that just explodes all of a sudden. (Brosnan was the only one who saw the signs.) As a result, the movie misses out on the truly scary pre-eruption symptoms, such as when the sides of a volcano start to bulge. Instead, the filmmakers give us a few cheap shocks, such as a small tremor when the scientists are exploring the volcano's crater or a hot spring that suddenly hits boiling point and scalds to death a couple of bathers. The special effects leading up to the big explosion are pretty standard stuff: earthquakes twist bridges and send store fronts crashing to the street, while a spooky grey ash falls like a blizzard and coats everything in a thick blanket. These scenes set the stage, but that's all they do. They're just foreplay, for the real reason the movie exists is to capture on film the unimaginably destructive force of the volcanic blast itself. This is when the digitized computer images take over as a huge pyroclastic cloud of super hot gases, ash, and rock fragments blasts down the volcano slopes at speeds over 100 miles per hour, flattening entire forests and everything else in its path. These scenes, with Brosnan and Hamilton trying to outdrive the explosion, are truly stunning. We see the town literally ripped into splinters. But the explosion scene itself actually only amounts to just a couple minutes of screen time. Everything before the big explosion is just so-so foreplay. 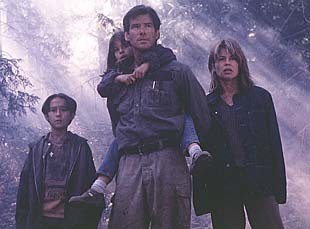 Other than the actual volcanic explosions themselves, little in this movie really uses Twister or Jurassic Park-styled computerized special effects. The special effects are big in scope, but for the most part, they're the same type of work that you'll find in Hollywood productions leading back to the earthquake scenes in San Francisco (1936) and the Chicago Fire in In Old Chicago (1938). The real reason to see Dante's Peak is for the big explosion itself. Nothing like it has even been captured on film before. But the rest of the movie creaks through overly familiar terrain: nobody believes poor Pierce about the imminent explosion (except for Hamilton, but she's smitten). Not even his boss believes him. How can he convince them? What can he do? Ho-hum.